On May 30, 2008, the cursing and honking finally stopped. It was replaced by cheering, waving, and general jolliness—as the beleaguered and obsolete Woodrow Wilson Bridge was finally replaced with the new Woodrow Wilson Bridge. Designed in 1956, the span was—and remains—one of only a handful of drawbridges in the interstate highway system. Originally designed to handle 75,000 vehicles a day, the old six-lane structure was handling 200,000 vehicles a day by 1999 and opening nearly 260 times a year. After much debate, the solution was determined to be doubling the size of the span to twin, six-lane bridges, each including double-leaf bascule spans over the principal navigation channel. At their apex, the new bridges would allow 70 feet of vertical navigation clearance—20 feet higher than the previous bridge—requiring far fewer openings. Construction of the bridge began with dredging approximately 340,000 cubic yards of material from the riverbed. Foundations for the new bridges would include steel pipe piles and 24-square-foot pre-stressed concrete piles, with larger steel pipe piles as much as 200 feet long. Construction continued with the installation of pre-stressed segmental concrete V-piers, steel box girders, concrete deck, operator’s house, machinery, electrical controls, and the installation of eight massive bascule leaves, each with a deck encompassing at least 11,800 square feet (1,096 m3). 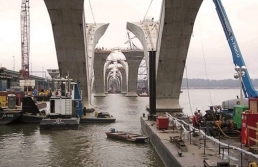 The cheering continued when the Woodrow Wilson Bridge Project was named the winner of the American Society of Civil Engineers’ 2008 Outstanding Civil Engineering Achievement Award.